How to Call Poland from the U.S.
Want to save when making a call to Poland? 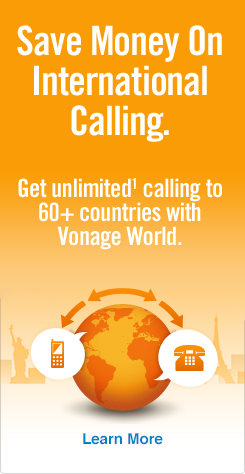 Look no further than Vonage World®. Whether you’re calling friends in Warsaw or relatives in Kraków, make your call to Poland affordable and easy with Vonage World®. Forget about confusing calling plans and restrictive calling cards. With Vonage you’ll enjoy low-cost, reliable home phone service with unlimited¹ calling to landlines in Poland. With savings like this, you can feel totally guilt free when calling Poland from the U.S. So go ahead, dial away! When you add Vonage Extensions™ to Vonage World®, you can extend your home calling plan to any phone, including mobiles, at no extra charge. So you can call Poland from both your home and mobile phones on the same plan. You’ll also be able to make unlimited¹ calls to landlines in more than 60 countries and mobile phones in more than 10 countries and territories. Now that calling Poland from the U.S. is so easy, why not chat with relatives more often? With Vonage, you can add a local Warsaw number to your account. That way, your friends and family in Warsaw can make a local call that rings right to your home phone in the U.S. It’s called a virtual number and is inexpensive and easy to use; you get a phone number from a different domestic or international location that rings to your home phone. By adding a virtual number to your Vonage World® plan, you can save your friends in Poland from expensive international calling charges when they call you. Of course, with Vonage World® you can make unlimited1 landline calls to them. Next dial 48, the country code for Poland. Then dial the area code (2 digits). Does your number to call Poland start with a (+)? What does it mean? Some international numbers have a plus sign before the country code. This (+) simply means that when dialing this number internationally, the country exit code needs to be used. In some cases, you can dial “+” on a cell or VoIP phone, or simply replace the plus sign with your country’s exit code. For calls to Poland from the U.S. using Vonage, you can replace the “+” with “011,” but they’ll both work. Have family in Poland who often call the U.S.? Here’s an idea: Why not give Vonage World® to your friends or family in Poland? It’s easy… just sign up for a Vonage World® account for them and ship them the Vonage Box™*. That way they can make unlimited¹ calls to landlines and mobiles in the U.S. Imagine your brother in Warsaw having the same U.S. area code as you. You and anyone in the U.S. can reach him on a U.S. number, rather than paying international rates to call Poland. And if you both have Vonage, calls between you are included at no additional charge! Vonage works anywhere there’s a high-speed Internet connection. Need more help with how to call Poland? Here is a list of major area codes and city calling codes in Poland.